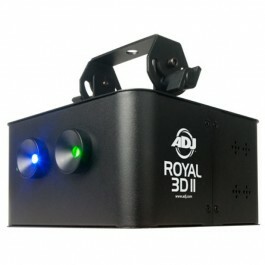 The ADJ Royal 3D II offers intelligent laser features, featuring green and blue beams with the popular "laser sky" effect, along with new dynamic programs that will light up the dance floor. Get your show going quickly with 15 exciting built-in programs that can run in sound active mode, so you don't have to do the programming. We know that a smooth transition of lights from ones side of the room to the other is essential to keep a visually engaging experience going, so the 1.8 degree stepper motors and 90 degree beam angle will do just that.